“Her energy is awesome. Anissa is very friendly and does not meet any strangers,” says Monarch Employment Support Professional (ESP) Precious Haynes who has worked with Goss since April, assisting her in finding employment. Together, Haynes and Goss determined the most effective resources available to help in her job search and reviewed what roles would best fit her experience. “Through the process, I found out things I didn’t know about myself,” Goss admits. 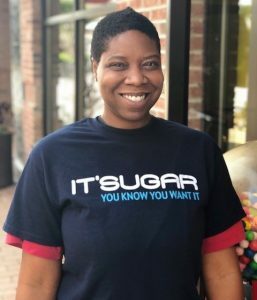 After working at a few jobs that turned out to not be a good fit, Goss accepted a part-time sales associate position at IT’SUGAR candy store in Cary’s Parkside Town Commons. In a few short months, she was promoted from associate to assistant manager, and now serves as store manager. Goss strongly suggests working with Monarch’s IPS team to others struggling with mental health issues and who would like a helping hand in pursuing and securing employment. “I would tell them to sit down with the IPS team. They bring out what you are best at. Before you know it, you have your resume completed,” she explains. Goss also attributes her success to Monarch’s Employment Peer Mentor William Fletcher, recalling his assistance when she was having car issues and he came to the rescue. “Finding a job is overwhelming. To have the support of the team, takes some of those burdens off your plate,” she notes. Working with Haynes has allowed Goss to realize other potential career options, stating that she is considering a return to school next January to possibly pursue x-ray technology. “I was kind of lost when I got here. Intake day was a great day for me,” Goss describes of her first meeting with the IPS team. Photo caption: Anissa Goss takes a break from her job as store manager at IT’SUGAR in Cary.